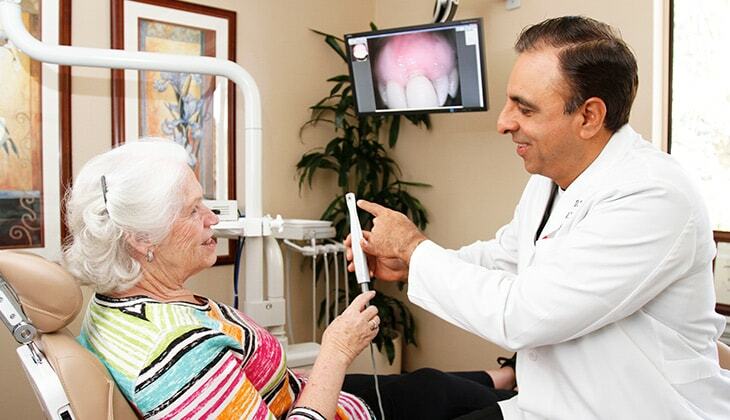 Gum Recession Treatment in Mission Viejo | Orange County Periodontists | Ajay B. Setya, DDS, MSD Robert C. Hirst, DDS, MS Christen S. Bergman, DDS., MS.
Our doctors provide effective gum recession treatment using advanced procedures. Gum recession exposes the roots of the teeth and makes them appear unusually long. Exposed roots cause your teeth to be sensitive to heat and cold. Your tooth root surfaces are also softer than tooth enamel and thus more susceptible to increased damage. Dr. Setya, Dr. Hirst, and Dr. Bergman are highly trained specialists and repair gum recession with minimally invasive gum grafting procedures. After restoring your lost gum tissue, your smile will be enhanced, your teeth will no longer be sensitive and your tooth roots will be protected from further decay and infection. Tooth roots are softer than tooth enamel and are more prone to erosion and more sensitive to heat, cold and sweets. They can also be damaged from bacteria, food acids and aggressive brushing. Teeth with exposed roots can eventually become so worn down that they loosen or fracture. When gums are too thin around the teeth, they cannot support the teeth adequately and the gums will eventually recede. Gum grafting can also be done to build back gum thickness and prevent eventual gum recession. Our doctors use advanced techniques and micro-surgical instrumentation to graft gum tissue. Microsurgery instruments are far less invasive and require far less suturing than surgery using standard instruments. There is less post-operative discomfort and healing is much faster. Dr. Setya can perform the Chao Pinhole® Surgical Technique. With this procedure, no actual grafting is performed, and there is no need to remove healthy tissue from another area. There is no cutting or sutures and there is a faster recovery time. This technique is done using a local anesthetic and can be performed in one to two hours. Gum tissue for a graft is either obtained from the palate or procured from a human tissue bank. For palate grafts, the doctor uses micro-instruments and retrieves a millimeter-thin strip of the strong tissue that sits just under the surface layer of the palate. The surface layer is left intact. The doctor seals up the graft site and adds growth proteins which speed healing, help regenerate new tissue and reduce discomfort. This procedure is far less invasive, heals far faster and is much more comfortable than full palate grafts taken with standard instruments. Dr. Setya, Dr. Hirst, and Dr. Bergman use surgical “tunneling” techniques for gum grafting which remove the need to make incisions around the gum line of teeth and pull the gums back in flaps. Instead, using micro-instruments, the doctor gently separates the outer and inner layers of gum tissue and creates a pouch. The graft material is placed into the pouch to build gum thickness and strength. The outer layer of gum tissue is then pulled up toward the crown of the tooth and secured there, forming a new gum line. The result is a restored natural gum line supported by thick, healthy gum tissue. Your new gums will look completely natural in color, will blend smoothly with your natural gum tissue and will be very strong. Your tooth roots will be protected from further erosion and your smile will be enhanced.